War, Shared Sacrifice And Faces Of Valor : Blog Of The Nation President Obama recently announced that the "war in Iraq is over" and all U.S. troops will withdraw by the end of the year. It's hard to believe that 10 years have passed and even harder to grasp how many lives have been lost in Iraq and Afghanistan. 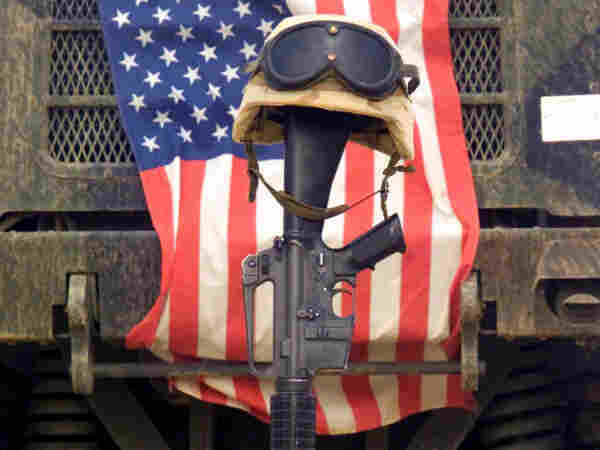 An M16-A2 service rifle, a pair of boots and a helmet stand in tribute to a fallen Marine Corps Sergeant assigned to Marine Wing Support Squadron Three Seven One (MWSS-371), killed in action in Iraq during Operation Iraqi Freedom. Following the President's announcement that soldiers will be out of Iraq by the 31st of December, we've been spending a lot of time batting around story ideas, debating how to cover it. There are so many threads, and one we keep coming back to is the human story. The soldiers who lost their lives, and the families who mourn them. The soldiers who have come back with incredible injuries, who are learning how to live without limbs, or with brains that don't work the way they used to. The families that functioned without mom and/or dad through multiple tours, and the support systems that made that possible. Staff Sgt. 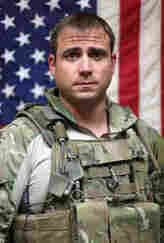 Michael W. Hosey was killed in a firefight with insurgents Sept. 17, 2011. 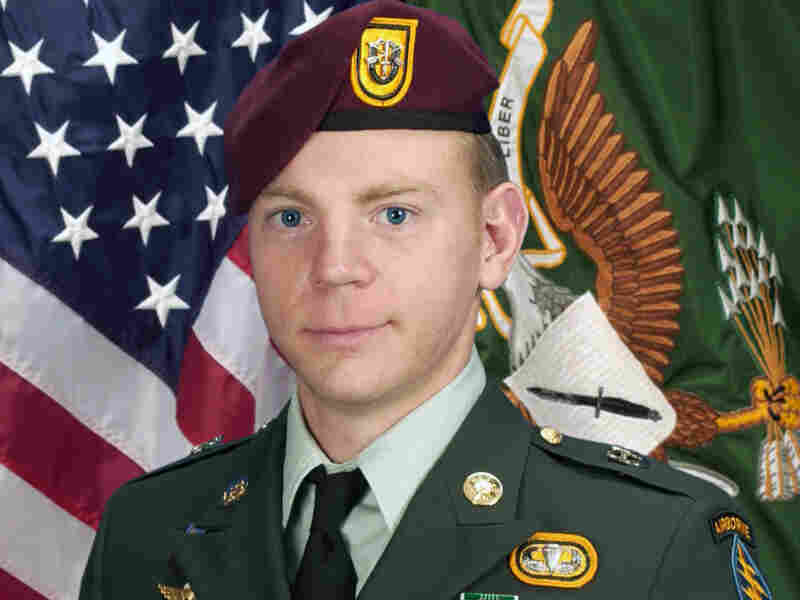 Hosey, 27, a native of Ala., joined the Army in 2001 as a communications intelligence specialist. There have been 4,482 military fatalities in Iraq, as part of Operation Iraqi Freedom and Operation New Dawn. In Afghanistan, 1,822 troops have died in Operation Enduring Freedom. Tens of thousands have been wounded. The numbers are staggering. The Military Times has a Hall of Valor, a database of nearly all the American men and women who have died in the wars, many with photos and a short biography. When the people behind the numbers — the names, faces and stories are added, the weight of the sacrifice becomes so much heavier. Sometimes we forget the impact of war and how many people have died, how many lives and how many families have changed forever. The Hall of Valor is a good reminder. And then there's the story that broke this past week about Sgt. 1st Class Kristoffer B. Domeij, 29, who died last Saturday. He was on his fourteenth combat deployment. Fourteenth. He enlisted right out of high school, and spent ten years rotating in and out of conflict zones. He's survived by his wife and two daughters, his brother and mother. Almost immediately after reading that story it was hard not to wonder how many other soldiers have done so many tours, and how that time will affect the rest of their lives. And with veterans increasingly facing unemployment and even homelessness, aspects of coming home can be at least as trying as being deployed. So much of it comes down to the question of shared sacrifice. Less than one-half of one percent of the U.S. population serves in our all-volunteer army. A recent Pew Research Center poll on the military-civilian divide points to some of the strains that creates. More than eight-in-ten (84%) of these modern-era veterans say the American public has little or no understanding of the problems that those in the military face. Most of the public (71%) agrees. Many Americans also acknowledge that since the 9/11 attacks, the military and their families have made more sacrifices than the public at large. But even among this group, only 26% say this gap is "unfair," while 70% say that it's "just part of being in the military." I think the notion of "shared sacrifice" has been embraced in the abstract, but not in reality by most of us who lack a loved one in the military. I know my country is at war, but I see very little direct impact of the past decade of war in my daily life ... I am torn between feeling ashamed at not doing more and angry at my government for not making it clearer to us how we need to sacrifice. And perhaps that's where the story goes next. We didn't plant victory gardens, or collect tin foil from cigarette packs. But as the last 40,000 or so troops return home, joining the more than 100,000 who are already here, there will be plenty to do for them, plenty of ways to help out. The trick is figuring out how.